A coalition of the willing teed it up today at TPC Scottsdale in Media Day for the Waste Management Phoenix Open. Looks like a two-way tie at -9,which is solid golf in a modified scramble format. 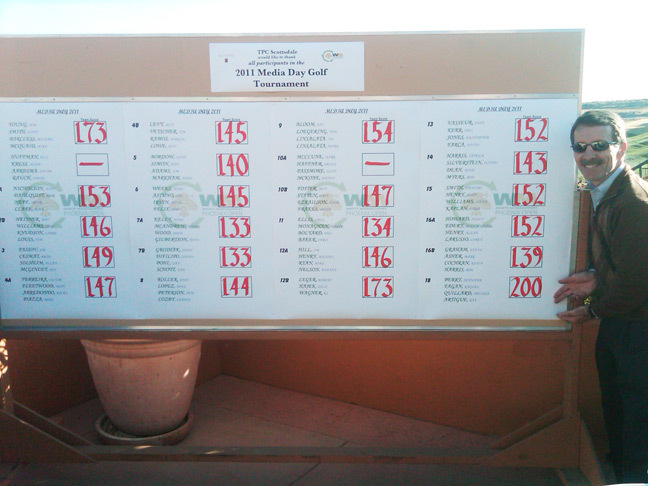 And check out Ray Artigue proudly displaying his team’s sweet 58-over-par 200 like he’s a Price is Right model. Gotta admire a guy who can post a score like that and still smile. To be fair, he was a member of the group in name only, but we’re not going to let that get in the way of having a little fun at Ray’s expense.